There were a few things that drew me to this book. 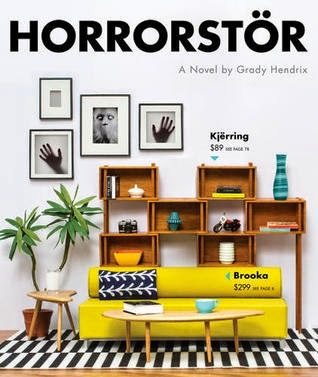 A haunted house that's really an Ikea-like store is an interestingly unique idea. The idea alone appeals to me. I also liked the idea that it would take visual cues from Ikea catalogs (each chapter is headed with an item description). I did my time in retail. And it's set in Cuyahoga County, near where I grew up. Hendrix uses his retail setting very well. If you've worked retail, you'll recognize the store, the displays, the corporate doublespeak. I was a Linens n Things inmate, Back in the Day. A couple steps down from Ikea and the fictional Orsk, a couple steps up from Walmart. So much felt true to my memories of the place. Especially how weird and creepy those home-like displays look when the store is closed. I feel like this is a book that will appeal most to people who did or are doing the retail thing, for more than just a summer job. But beyond the gimmick, how is it? Actually, it's pretty creepy. It's an extreme, violent haunting, but it doesn't start full throttle. If it did, it would quickly become overwhelming. It's actually the more subtle stuff towards the beginning that I find so much creepier, like the mysteriously appearing graffiti. I also sort of appreciate that we get to see the aftermath in the main character's life. The ending is basically open, but satisfying enough. Yes, the book is built on a gimmick, but it's a good gimmick. The story's pretty standard, but the setting is new enough (and has enough personal resonance) to feel like a step or so above your average ghost story. I'll definitely be looking more suspiciously at fake showroom doors in the future.